J. Roddy Walston & the Business rock. Sometimes that’s a cliche, and sometimes it’s the only way to describe what a band does. This band, fronted by the volatile and captivating Walston, rocks, and rocks hard. I had the pleasure of seeing them back in September in Chicago, and they had an incredibly diverse crowd — everyone from soccer moms to hipster girls to baseball capped bros — in the palms of their hands from the first chord. Walston writes hook-filled piano pop songs that the band backs with intense guitar lines and one of the best rhythm sections around, which turns simple choruses into dance-along, shout-along barnburners. I’ve only seen them three times since Ash introduced me to the band five years ago, but I can still firmly say that they’re one of the best live experiences out there. J. Roddy & the Business are touring in support of a new record right now; Essential Tremors , which was released on ATO back on 9/10. In Chicago, I saw them at the beginning of the tour, and I was still pretty unfamiliar with the new songs. Now, I’ve spent a weekend listening to pretty much nothing but this new record, and I am damn excited for their show at Kings tomorrow night. Essential Tremors take the sounds that Walston and his band have been building through their live shows and previous self-titled LP, high volume guitars and repetitively yelped vocals from Walston himself, but even from album opener “Heavy Bells”, it’s obvious that the band is expanding their sound, with the over-fuzzed chorus nearly drowning out a vocal line that’s pushed to the breaking point anyway. It rumbles through a scene-setting instrumental break into Walston wailing the title over and over again, and then with a brief pause for a pealing guitar line, Essential Tremors morphs straight into the delicious piano grunge sleaze that I have come to expect and love from the Business. There’s nothing complex about the songs on this record, or particular word play in the lyrics; that’s not what makes Essential Tremors and J. Roddy & the Business so great. These songs are simple, straightforward, and they simply, straightforwardly drive you to drink and dance and wave your hands in the air. They’re also thoughtful and real, like the slow-downed “Boys Can Never Tell”, which is part confessional and all full of J. Roddy’s wild and heartbreaking rasping vocals. Walston has said that this record is more open — the title is taken from a medical condition that he suffers from — and the quiet fuzzed out beauty of that track says all you need to say about the band’s ability to rock something intimate and clever and sad. Essential Tremors finishes up with the hooky, oooh-oooh backing vocals filled “Same Days”, the deliciously ragged piano-heavy “Tear Jerk”, and the soul-infused “Midnight Cry”, a record that draws each song from a different place in musical history, and fuses all those styles into a journey that’s personal and simple all at once. It’s a great record, thoughtful in its uncomplexity, and there’s nothing else in the world like watching J. Roddy about half thrash his keyboard to death while he wails those songs out live. I don’t often get to see touring bands more than once in a year; that I am doing so for J. Roddy & the Business should tell you just how good they are live. 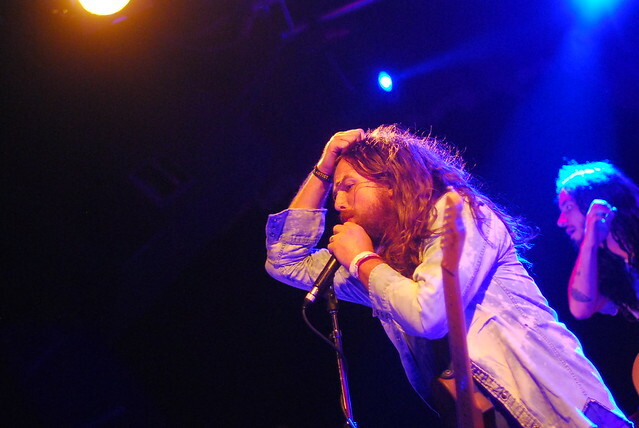 J. Roddy Walston & the Business play Kings Barcade in Raleigh tomorrow, 10/29. Door 8pm, show 8:30, Reignwolf opens, and day-of tickets are $15. Be there or be un-rocked.